Tea tree oil is one of the most widely used and popular essential oils in the world. It has been used for hundreds of years by the indigenous people of Australia and New Zealand for many common health ailments. This article will share with you six great ways to use tea tree essential oil, plenty of interesting research into its health benefits, and why tea tree oil needs to be part of every home’s first aid kit. Like eucalyptus, tea tree also belongs to the myrtle plant family Myrtaceae. The variety most often used for medicinal purposes is Melaleuca alternifolia. Other varieties of melaleuca are popular with aromatherapists too, such as Melaleuca quinquenervia (also known as naiouli) and Melaleuca ericifolia. But Melaleuca alternifolia is the most commonly used and studied variety which we’ll focus on here. The tea tree got this name when the 18th century sea captain, James Cook, traveled to Australia. The story goes that he was given some herbal tea brewed from the leaves of the melaleuca tree. He liked it and he dubbed the tree the “tea tree.” Captain Cook reportedly even gave the tea to his crew to prevent scurvy. Tea tree grows abundantly in Australia, but is also found in New Zealand, Florida, China, France, and even Guatemala. They grow especially well in swampy regions − tea trees like having damp feet! The essential oil is steam distilled from the leaves of the tree. It takes 1,000 pounds (454 kilograms) of Melaleuca alternifolia leaves to yield 10 to 15 pounds (4.5 to 6.8 kilograms) of essential oil. The aroma is pungent, like camphor, but also spicy and fresh like eucalyptus, with a distinct medicinal quality. The indigenous people of Australia have a long history dating back thousands of years. They used (and still do use) tea tree extensively for healing. Traditional uses include healing poultices for cuts, wounds, and infections, as well as inhalation of the vapor from crushed leaves to treat respiratory complaints. They also drink a tea from the crushed leaves to help heal colds and flu, and make an ointment using crushed tea tree leaves combined with animal fat for applying to wounds and other skin complaints. In the 1920s, Dr Arthur Penfold, a well-known Australian chemist, found that tea tree oil was 13 times stronger − and more effective at healing infections − than carbolic acid which was the common disinfectant of that era. Australian servicemen of the 1930s and 40s included tea tree oil in their personal first aid kits, thus possibly being responsible for its worldwide popularity. There are well over 100 phytochemicals (natural, plant-derived chemicals) in Melaleuca alternifolia. It is mainly comprised of terpenes, monoterpenes, sesquiterpenes, and their alcohols. The phytochemical in largest quantity is terpinen-4-ol, which in a typical sample is at least 40% of the oil. The other compounds found in the highest quantity include alpha-pinene, alpha-terpinene, limonene, 1,8-Cineole, gamma-terpinene, and alpha-terpineol. Tea tree oil has long been used to get rid of the bacteria that cause body odor and acne. Recent research indicates it is also effective against some fairly deadly bacteria such as methicillin-resistant staphylococcus aureus, better known as MRSA, which is currently plaguing our hospitals and medical facilities. October 2016 research appearing in Applied Microbiology and Biotechnology by Chinese researchers found that tea tree oil was quite effective against Escherichia coli, Staphylococcus aureus (golden staph), and Candida albicans. It worked by compromising the cell membrane of these bacteria and fungi, ultimately leading to cell death. One of the problems associated with widespread use of antibiotics is that bacteria are developing resistance to these drugs. In 2015, Brazilian researchers found that tea tree oil was effective against Staphylococcus aureus which exhibits resistance to multiple antibiotic drugs. Interestingly, Malaysian researchers published an article in 2013 in the journal Phytomedicine which investigated the relationship between various essential oils and antibiotics. The researchers found that none of the oils evaluated (including melaleuca alternifolia) caused an adverse reaction when taken with various antibiotic drugs. 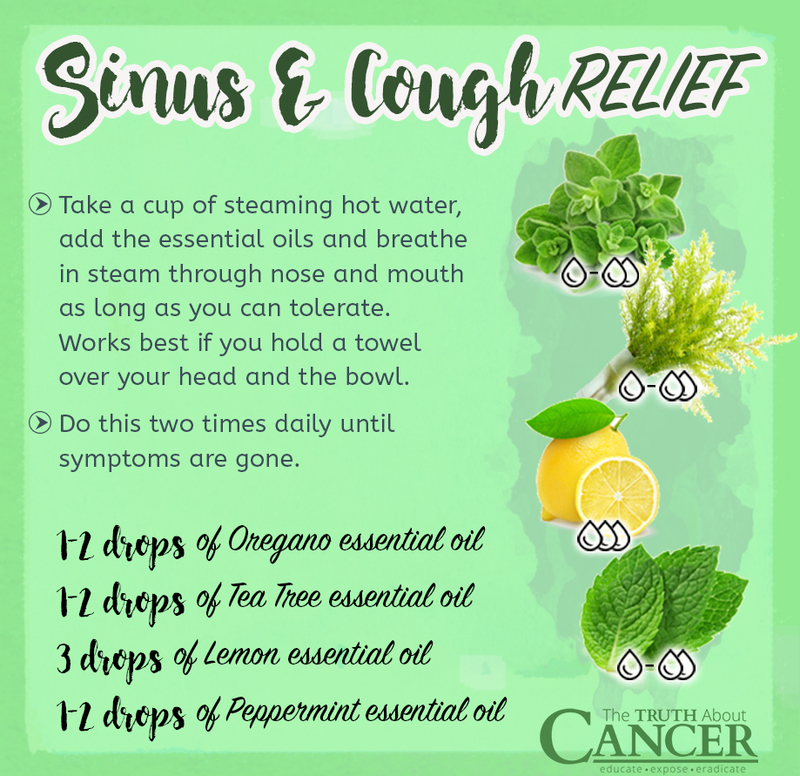 They found that the use of some of the essential oils (namely peppermint, cinnamon, and lavender) along with antibiotics provided a synergistic effect! Joint Australian and American research reported in Journal of Dermatological Science in 2012 found that tumor-bearing mice given a combination of melaleuca alternifolia and dimethyl sulphoxide (DMSO) activated an immune response and resulted in tumor cell death. Two 2010 Australian studies with mice found that tea tree oil and its major active terpene component, terpinen-4-ol, had anti-tumor activity against two cancer cell lines: mesothelioma and melanoma. Researchers stated that tea tree oil “significantly inhibited the growth” of these two tumor cell types. Chinese researchers in 2009 reported that tea tree oil had both antimicrobial and anti-cancer effects. They found that tea tree oil exhibited strong cytotoxicity (toxic to cancer cells) against human lung cancer cells, human breast cancer cells (MCF-7, which are hormone receptor positive, infiltrating ductal carcinoma) and human prostate cancer cells (PC-3, which exhibit high potential for metastasis). Italian research reported in 2004 investigated tea tree oil against human melanoma (M14 WT) cells, as well as Adriamycin-resistant melanoma cells. Tea tree oil induced apoptosis (planned cell death, lacking in cancer cells) against both cell lines but especially the Adriamycin-resistant cells. 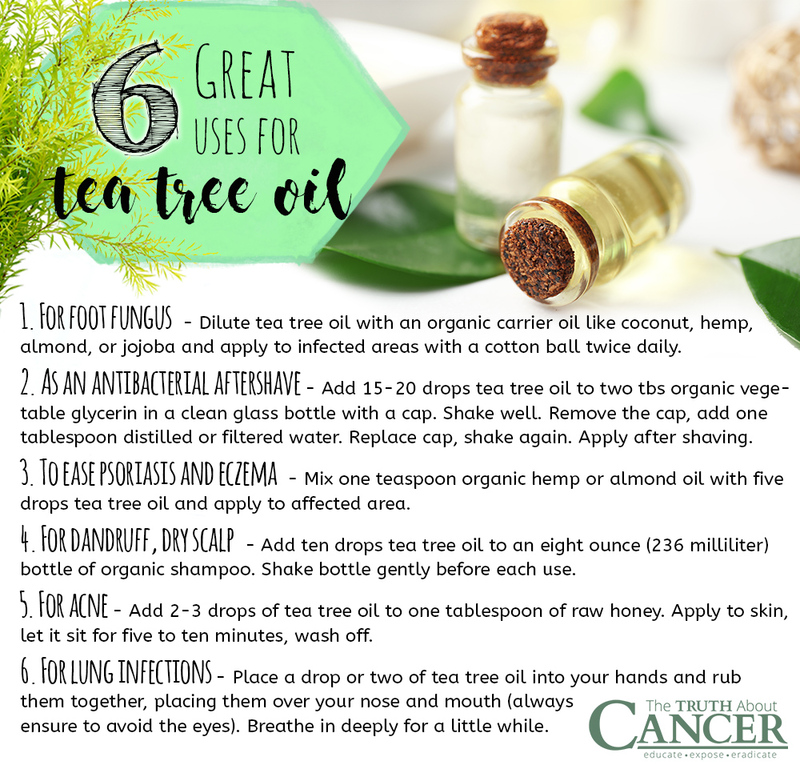 Tea tree oil has been used for decades to help treat conditions like jock itch, nail fungus, and athlete’s foot because of its excellent anti-fungal properties. In 2016 Italian researchers scrutinized several different essential oils including basil, mint, tea tree, lavender, winter savory, and oregano for their antifungal effects against Candida albicans. They discovered the essential oils inhibited both the growth and activity of Candida albicans more efficiently than a popular antifungal drug, clotrimazole. A 2015 Australian study investigating fungal contamination in indoor environments looked at tea tree oil and four other agents, including industrial strength disinfectants. Researchers noted that of the five substances tested, the tea tree oil exhibited the best inhibitory effect on the growth of the two fungi studied. Tea tree oil was just as effective applied as a liquid or vapor. Cancer patients often suffer from oral yeast infections due to the treatments they undergo. In 2006, UK researchers found that tea tree oil was effective against 301 different kinds of fungal infections found in the mouths of 199 patients with advanced cancer. Researchers stated that the tea tree oil was even effective against 41 fungi that were known to be resistant to traditional antifungal drugs. Older research reported in 1992 by Australian researchers found that tea tree oil was quite effective in treating the symptoms of tinea pedia (athlete’s foot). They noted that tea tree oil was just as effective as tolnaftate, a popular anti-fungal agent. A plethora of research studies exist attesting to the anti-inflammatory properties of tea tree oil. In 2014, Brazilian researchers found that in addition to being an anti-inflammatory, tea tree oil also stimulated human macrophages, a type of white blood cell of the immune system involved in engulfing and destroying bacteria, cancer cells, microbes, etc. A study reported in May 2016 by Brazilian researchers discovered that tea tree oil was effective against the eggs and larvae of Haemonchus contortus (aka the barber’s pole worm, a common parasite of ruminants). A 2009 Italian study found that tea tree oil was effective against equine ringworm. Tea tree oil has long been used for easing the pain and itching of chickenpox and cold sores, both caused by the herpes simplex virus. Tea tree has also been found to be helpful against influenza; even the H1N1 virus strain. 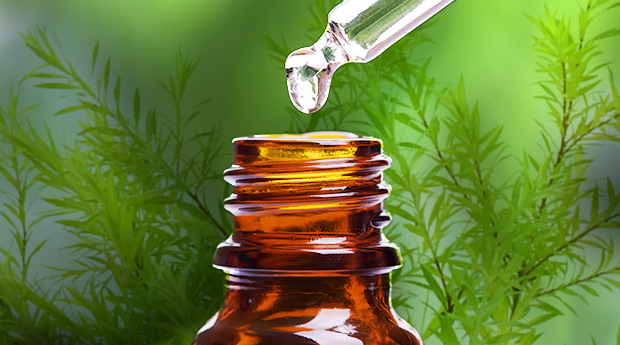 Tea tree oil has a lengthy history of use for easing lung congestion and infections. Indeed, a Chinese animal study reported in 2016 found that a nanoemulsion of tea tree oil was effective against fungal and bacterial pneumonia due to its anti-microbial, anti-fungal, and anti-inflammatory properties. Tea tree oil is also very effective against the bacterium that causes Legionnaire’s Disease, which adversely affects the lungs much like pneumonia. Italian scientists reported in 2009 that Legionella pneumophila was “exquisitely sensitive” to tea tree oil. They further stated that tea tree oil should be investigated for use as an anti-Legionella disinfectant, and for control of water system contamination in places like spas, small water lines, and in respiratory medical devices. Tea tree oil has been used by indigenous Australians for hundreds of years as an insect repellent, and also as an aid to heal insect bites. In addition, a study reported in 2015 by Brazilian researchers found that tea tree oil was effective against two fly species. Although it is generally not recommended to take tea tree oil internally, it can be used for a variety of dental complaints. See “Precautions” below for more information about internal use. In 2015, Indian researchers reviewed hundreds of studies on essential oils to investigate their therapeutic effect in a dentistry setting. They found that tea tree oil’s antibacterial and antifungal benefits made it a promising agent against oral pathogens. Tea tree oil has also been found to be useful for periodontal disease. A 2016 Indian study found that a gel made from coenzyme Q10 and tea tree oil proved to be effective in the treatment of chronic periodontitis. Psoriasis, eczema, dermatitis, sores, wounds, sunburn, warts, acne, and insect bites… down through the centuries all of these conditions have been eased using tea tree oil. Modern science is catching on to the reasons why it’s so beneficial. A 2013 review of various studies on tea tree oil by Iranian scientists discusses its antimicrobial, anti-inflammatory and antioxidant properties. They also stated that tea tree oil accelerated wound healing and exhibited anti-skin cancer activity. A human study by Australian researchers reported in the British Journal of Dermatology in 2002 found that tea tree oil was able to reduce histamine-induced skin inflammation in 27 volunteers. Knowing how to properly dilute tea tree oil is important. Use too much and you might end up with irritated skin. Use too little and it may not help the problem you have. Tea tree oil contains phytochemicals that may cause an allergic reaction in people who have sensitive skin. It is always best to dilute tea tree oil before using topically. For foot fungus – Dilute tea tree oil with an organic carrier oil like coconut, hemp, almond, or jojoba. A good dilution would be one part tea tree oil to one part carrier oil (a 50 percent dilution). Apply to infected areas with a cotton ball or cotton swab, twice daily for best results. If the fungal infection is severe and skin cracks are present, it may be too painful to use a 50 percent dilution so dilute it down further. Continue using until problem heals. As an antibacterial aftershave – Add 15-20 drops tea tree oil to two tablespoons organic vegetable glycerin in a clean, empty glass bottle with a cap. Shake well. Remove the cap, add one tablespoon distilled or filtered water. Replace cap, shake again. Apply after shaving. To ease psoriasis and eczema – Mix one teaspoon organic hemp or almond oil with five drops tea tree oil and apply to affected area. To make it ultra-soothing, add five drops of lavender oil to the mixture. For dandruff, dry scalp – Add 10 drops tea tree oil to an eight ounce (236 milliliter) bottle of organic shampoo. Shake bottle gently before each use. For acne – Add 2-3 drops of tea tree oil to one tablespoon of organic raw honey. Apply to skin, let it sit for 5-10 minutes and wash off. Both the honey and the tea tree oil are excellent anti-bacterial agents. For lung infections – Place a drop or two of tea tree oil into your hands and rub them together, placing them over your nose and mouth (always ensure to avoid the eyes). Breathe in deeply for a little while. This is the best method for getting the essential oil into your lungs and bloodstream. You can also diffuse tea tree oil into a room where you will be sitting or working. Be sure to use an ultrasonic, cool mist diffuser for best results. Never heat essential oils because doing so can reduce their therapeutic benefits. Be sure to only use a high quality, medicinal grade essential oil. Tea tree oil is often heavily adulterated with other chemicals and fillers in some parts of the world, so if you wish to use tea tree oil medicinally, be sure that your oil is labeled with the genus (such as Melaleuca alternifolia), and is organically grown and distilled using the best distillation practices. It is NOT suggested to take tea tree oil internally. As one website advises, “In 2011, Poison Control received nearly twice as many calls about tea tree oil than any other named essential oil, including cinnamon oil, clove oil, and eucalyptus oil. More than 10 percent of people exposed to tea tree oil were treated in a hospital or doctor’s office.” Tea tree oil should not be taken by mouth for any reason. If you wish to use it for dental health, however, be sure to spit out the oil afterwards to prevent any potential problems which could include dizziness, digestive problems, or hives. Avoid using tea tree oil if pregnant or nursing. While it may be perfectly safe, no studies have been done to prove this, so it is best to avoid using tea tree oil during this time. Tea tree oil has been deemed to be safe for children over the age of six months, but please use essential oils with great care when putting on children. Dilute heavily. For instance, for every ounce (29 ml) of organic carrier oil, only use 3-5 drops of tea tree oil for children six months and older. This is a general guideline only. If unsure, always work with a qualified aromatherapist. It is not advisable to use any essential oil as a sole therapy for cancer, or for any of the other health concerns mentioned in this article. When used in combination with other conventional and alternative medical treatments, however, essential oils such as tea tree oil can be very effective in helping the body heal. I used about 12 drops of tea tree oil in a cup of coconut oil to make my own yeast killing suppositories because the store bought were expensive and did not work for long. Hi Karen, it really depends on the type of lung cancer but I learned, that with homeopathy there are some really good results. There was a famous American homeopathic teacher Chaterine Coulter. She published together with an Indian doctor Ramakrishnan a book about the homeopathic approach to cancer. I am here in the States just on vacation, all my book are back in Germany in my practice, but I remember that several cases about lung cancer with specific details were discussed in her book. Maybe it is a good idea to find an experienced homeopathic doctor who is familiar with the special plussing method with is very effective in homeopathic cancer treatment and also taught in Germany. My favorite oil for this is a mixture of organic myrrh, Francincense and with colon and stomac cancer rosemary oil, with lung cancer thyme oil, with ovarian cancer chamomilaoil. For inhalation frankincense oil with cold diffuser or 1 drop every six hours either in the nostrils or on the tongue and deep inhaling, which ever feels better. Wishing all the best. equal parts of apple cider vinegar and coconut oil is supposed to work. Years ago when my kids were small, I used Tea Tree in the laundry to get rid of lice or bugs as well in the sheets and blankets, prior to washing stuck things in the deep freeze for 24 hours then washed the items. Washing the hair to help get rid of the bugs does work. My dad use to drink a table-spoon of Apple cider vinegar with honey to help ward off colds etc, he use to make his own yogurt too. But now he’s got bowel cancer, he’s had chemo, and the surgery left him with a leg problem, they tried rehab, but that didn’t work, the doctors have told him that there’s nothing they can do, they have ordered from the hospital staff a hospice, he’s not interested in eating, I’ve offered coconut milk etc, and he doesn’t want it. For all the proactive years he’s tried to maintain a healthy life, to now accept at nearly 84 ? It’s been a long long seven difficult weeks for him, his first wife ( My mom) had 4 brain tumors and lung cancer, D 1996 his second wife had lung cancer 1997, his third wife had breast cancer, prior to all of that, my uncle had bone cancer from 1969 to 1990 for 20 years, so its been a long long, distance run at this cancer thing. I’m so glad that TY has gone well out of his way to provide and be proactive in Cancer solutions, but as much as the information is there, they have to want to do it. Thank you TY . Thanks for such an informative article. I was told I have MRSA on my ankle, and was curious about the carrier oil along with tea tree oil that would be combined for a topical application. The last thing I want to do is take antibiotics. Your thoughts? I agree with you Kristin. I love the info and articles but EVERY one now has an ad for products. I won’t forward this to my friends because of this. Hi, where can I find the product: coenzyme Q10 get made with tea tree oil for Chronic Periodontitis? Hi Magda, I work in Germany with my practice but live with my family just across the border in Belgium. ? If you have question concerning special oils or so it might be easier you send me via Facebook and send me a message there. You can find me under Muna Bittner and under sign from heaven. Or you google me and naturheilpraxis. The last statement of this paragraph, is misleading the reader to believe that that you are advocating the use of antibiotics in conjunction with essential oils because of their combined synergistic effect. The added exclamation point also gives the impression that you are even enthusiastic about it. Though I can see and understand the intent in writing it in this way, the first impression I feel when reading it is that you are saying, “Using antibiotics with essential oils is a great combination because of the synergistic effect!”. In reading further into this, it seems like a complete lack of integrity on your part because you’re saying the very opposite of everything else you said about the use of antibiotics in the documentary series. I loved the series and I love all of the articles you’re putting out. The information is amazing and very helpful, and you’re doing humanity a great service with everything you’re doing. You have my full and continued support. Thank you, Dr. Silverman. What percent dilution do you suggest for an adult, and with which carrier oil? (Or water?) Thanks! I have heard so much about the benefits of tea tree oil, and I have experienced many of them myself. But I use it very sparingly, and I am afraid to use it on my sons. A few years ago, I read something about how it stimulates female hormones. There was even a case of a young boy who started to develop breasts, and it was traced to the fact that he was using shampoo and skincare products containing tea tree oil. I’ll admit that I’m too lazy to go back and look into any of this again. But I know that when I did look into it several years ago, there were enough warnings and stories from seemingly credible sources that I took them seriously. Since no one here is discussing the possibility of side effects (which, of course, even natural remedies can have! ), I thought maybe I should mention this issue. I just started using Tea Tree Oil lately and I find this post very inspiring! Love Tea Tree Oil! In all of my Essential Oils the most valuable and cherished is my Tea Tree. I haven’t used it for of all the items you have listed but probably 3/4 of them and some you haven’t listed. It is part of my cleaning regime and in air fresheners. It has been notably effective in everything I have tried. How to use on a skin cancer removed that is not healing? how to use this against breast cancer?